This past Wednesday we met with two of our friends, John and Catherine, to discuss our plans for a big day out on the Bund. After having a homemade cappuccino and discussing countless possibilities, we decided that everyone was too tired to actually do anything major. We decided to visit the Dongtai Road Antique Market because it was fairly close to us. I am glad that we did because the antique market was one of the more interesting shopping areas that I have been to so far. The validity of some of the items comes into question, but there are definitely some older looking items. Quite a few of the stalls sold little trinkets that I have seen in countless shops all over Shanghai, but there were a few gems. We did not spend too much time here before deciding to get some lunch at Kabb bistro. Both the antique market and the bistro were in an area that could be considered the French Concession, but more specifically a newer area called Xintiandi. Xintiandi is especially cool because it is right off of metro line 10, which is the one we also live off of. I love things that are close! 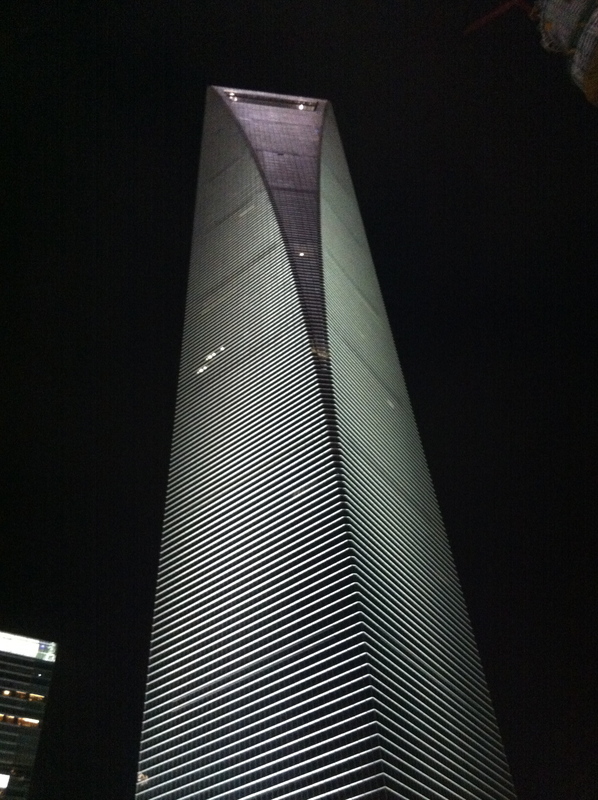 Later Wednesday evening we had plans to go to a bar in the World Financial Building, nicknamed the “bottle opener”. The bottle opener is in Pudong, which is where the iconic Shanghai skyline is. A small group of us traveled there after dark, which was a great idea. The sky was clear, and with all of the lights Shanghai was quite a spectacle. I was even asked to pose for a picture with a random Chinese couple. That made me feel famous. 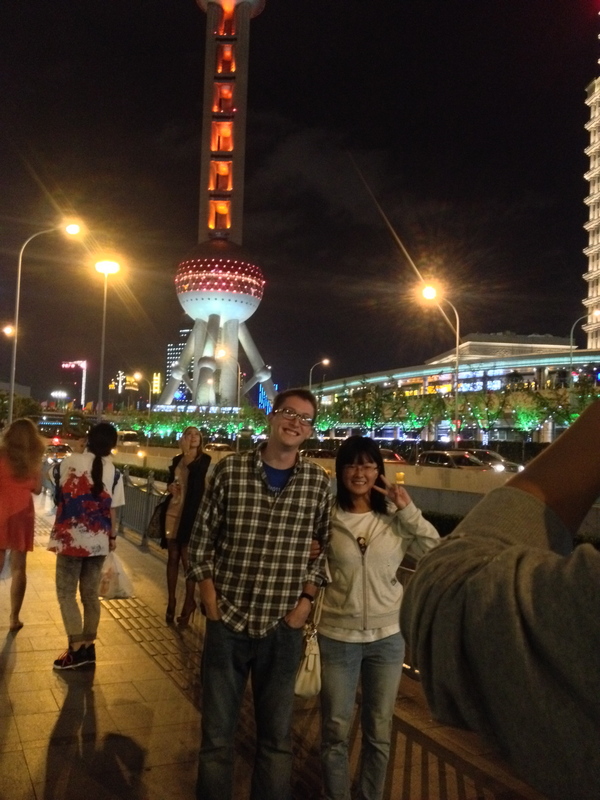 Behind us is the Oriental Pearl Tower, which is a famous building. Mostly because it looks cool. Try and spot it in the upcoming pictures. After walking through a valley of tall, brightly lit buildings, we came to the World Financial Building. You can see from the picture below why it is nicknamed the bottle opener. Our friend John informed us that you could pay to go up to the very top of the building, where there was a great observatory. Since we were all there, the group decided to travel up to the observatory before going to the bar. If you can imagine this being a giant bottle opener, the little opening that would actually open the beer is where the observatory is. The observatory ended up being more of an adventure than we anticipated, and probably took us about 30-45 minutes. 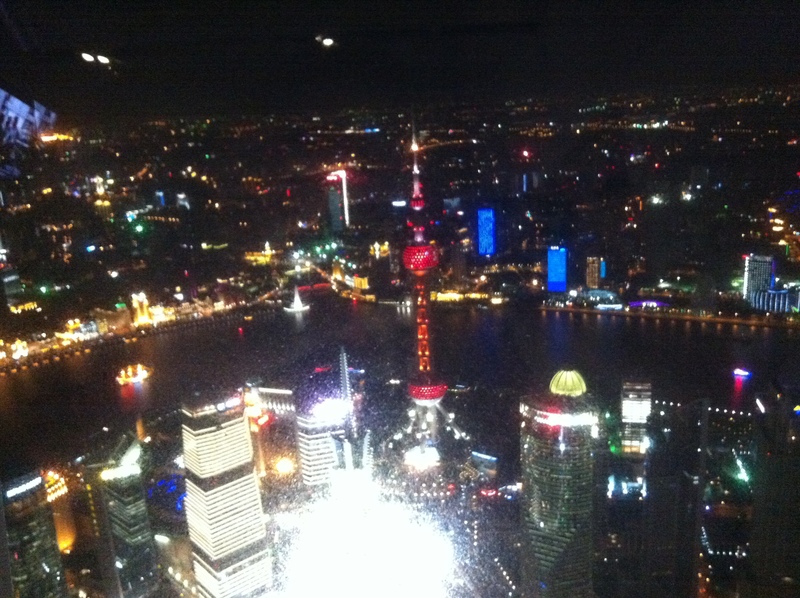 The view was well worth the 150 RMB entrance fee and the intense, ear-popping elevator ride to the 94th-100th floors. Alright, the elevator ride was so smooth that I didn’t even realize we were moving, but my ears definitely popped. Since we had to take pictures through glass, the photo below does not do the view any justice. It is well worth the trip, and I would especially recommend going here at night. The lights made it possible to see just how large Shanghai really is, and the crowds were minimal. After the observatory adventure, everyone decided they were too pooped to go to the actual bar, which apparently does not have much of a view anyway. John and Catherine did talk us into going to JZ’s Jazz Club though, after everyone else went home. There was no cover, and the Wednesday night band was very good. 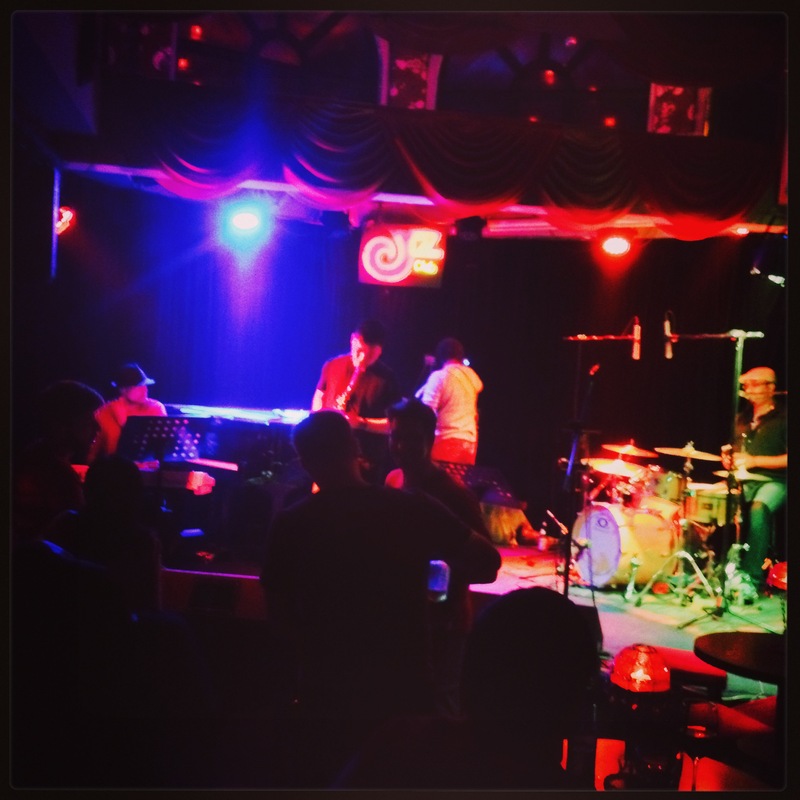 Drinks are not cheap, but the great music made it well worthwhile. I think this will be a place I come back to.